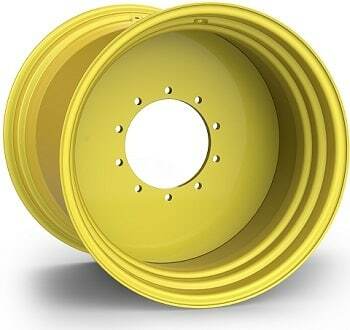 Our wheel rim range covers truck, trailer, agricultural, plant, earthmover, industrial, & turf applications. Standard & common spec wheel rims are kept on the shelf, whilst bespoke units can be manufactured to your given specification. At this time we do not offer wheel rims for car, 4x4 or smaller wheelbarrow / sack truck type machinery. Please contact us for more information. 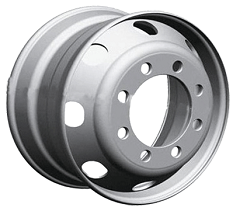 We carry a large range of common commercial wheels for van, truck, bus, larger trailer & caravan. These will be listed on the website soon, but for now please send us your wheel information via the Submit My Wheel Information Form, and we will contact you with a quote. Van, truck and bus wheels do come in some common popular sizes and bolt pattern configurations, so if you can provide us with at least some of the information we may be able to suggest a few options that could be what you are after. Most van, truck and bus rims will have either a 4, 5, 6, 8 or 10 stud bolt pattern. The studs/bolts can be varying distances from the centre of the wheel rim. It is clearly important that these measurements are taken correctly else the wheel rim will not bolt onto the hub/axle of your vehicle! Please read our guide to measuring your rim for help. For the less common wheel specifications, for say vintage buses, or American market vehicles, you may struggle to match up the specification with what we can offer from our 'off the shelf' range. This size wheel rim is often too small for us to manufacture in our workshop, so on occasion we may not be able to offer you a solution, but please contact us none-the-less and we will do all that we can to find something that will work. Wheel rims for tractor, agricultural, industrial and earth moving equipment tend to come in some standard 'off the shelf' wheel sizes and bolt configurations for popular vehicles, whilst other less common wheels/machinery require the wheel to be specially manufactured in our workshop to your exact specification. Standard Wheels - We carry a large range of common agricultural and industrial wheels for tractors, telehandlers, loaders, forklifts and other machinery. These will be listed on the website soon, but for now please send us your wheel information via the Submit My Wheel Information Form, and we will contact you with a quote. Manufactured Wheels - If your wheel rim isn't an off the shelf option we can usually manufacture it for you. The timeframes on manufacture tends to be between two and four weeks depending on the amount of work currently booked in to be completed. To help us find or manufacturer the wheel you're looking for, we need some key information. In addition to the Tyre Size and the Rim Size we also need to know exactly how the centre plate fits onto the hub (the Bolt Pattern / Stud Configuration). To pass us your information please fill in the form below and click 'Submit' to email it to us. This form is also available to Download in JPG Format or Download in PDF Format if you wish to print it out. Once we have received your information we will contact you with the cost and lead time to manufacture your order. Number of Studs - The number of studs drilled into the wheel/on the hub. If there is an even number of stud holes then we will need the Pitch Circle Diameter (PCD) (refer to 'C' below). If you have an odd number of stud holes then we need the distance between two adjacent studs (refer to D below). (A.i) Diameter of Stud Holes - The edge-to-edge internal diameter of each stud hole. (A.ii) Stud Holes Countersunk - If the stud holes are countersunk on the inside or the outside of the hub. (B) Diameter of Centre Bore Hole - The diameter of the centre hole in the rim. (C) Pitch Circle Diameter (PCD) - For an even number of studs. The distance between the centres of two opposite stud holes. 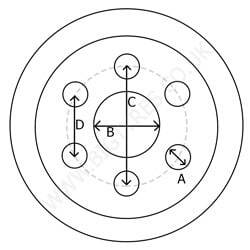 Also known as the Bolt Circle Diameter (BCD). (D) Distance Between Adjacent Studs - For an odd number of studs. The distance between the centres of two adjacent stud holes. (E) Distance of Centre Plate from Back - The distance between the centre plate and the back edge of the wheel. If you know the exact offset of the hub then you can provide it, but please specify whether the centre plate is offset towards the front or the back of the wheel. Our quick Offset Guide below might help, or you can contact us. The Pitch Circle Diameter (also Bolt Circle Diameter) is the diameter of the circle which passes through the centre of all of the stud holes. The simplest way to get the PCD is to measure from the centre of one stud to the centre of the opposite stud. If the wheel has an odd number of studs then you can measure from the centre of one stud to the centre of an adjacent stud and give us that measurement instead. Wheel offset is the distance from the middle of the rim to the to the mounting pad. The mounting pad is the rear face of the wheel centre which has the bore and stud holes. On a flat-disc wheel the mounting pad will be flush with the rest of the centre plate, but on a profiled disc the mounting pad will be raised. If the mounting pad is in line with the centre line then the wheel has Zero Offset. If the mounting pad is closer to the front edge of the wheel then the wheel has a Positive Offset, and if the mounting pad is closer to the rear edge then it has a Negative Offset. If we are manufacturing the wheel then we need either the Rear Spacing or the Wheel Offset.